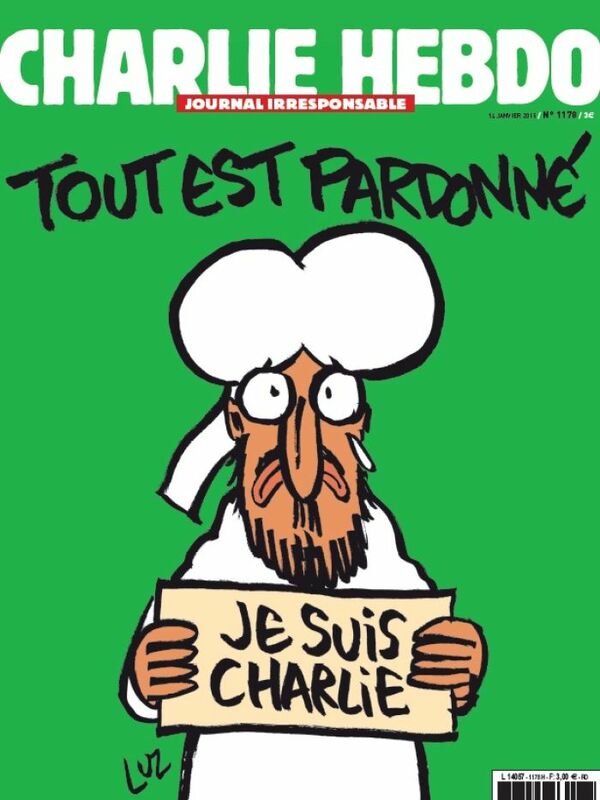 Defiant as ever, Charlie Hebdo put Mohammed on the cover of their “Survivors’ edition” — the first edition of the magazine following the murder of 10 of their contributors and staff. They had no choice. To do otherwise would be to give the killers the power of veto over what they published. Remember, any capitulation to violence is an encouragement to more violence, because it establishes in the minds of the perpetrators that the tactic works. I am not a muslim (I am not a follower of any religion, but that’s a topic for another day). So while muslims are constrained from making images of the prophet Mohammed, I am no more subject to that constraint than I am to their rules on the drinking of alcohol, or the eating of pork. The suggestion that non-muslims should be subject to the laws of a religion they don’t believe in is absurd. But there’s more to it than that. To many Australian Aboriginal tribes, the use of a person’s name after their death is a violation of their cultural protocols. Thus, when the lead singer of the band Yothu Yindi died in 2013, the Australian news media by general consent referred to him as Mr Yunupiŋu (despite the fact that several members of the band shared the same surname). Clearly, the non-aboriginal population of Australia don’t share — and probably don’t understand — this restriction, but they are willing to go along with it as a matter of goodwill. In a similar way, many non-muslim publications maintain a restriction on the display of images of Mohammed, not because they feel bound by the rules of a belief they don’t share, but simply out of courtesy to those who might be offended. Charlie Hebdo clearly saw the atrocities committed in the name of Islam as being so outrageous as to override any consideration for the feelings of its followers. After all, how do you respond to beheadings with courtesy? How do respond to the murder and enslavement of thousands in a spirit of goodwill? The depictions of the prophet are undoubtedly an insult in the eyes of many, but who defames Islam more, Charlie or the terrorists? And when we consider the institutions of modern life, there are few more powerful, and therefore more susceptible to corruption, than religions. After all, what greater power could there be over a believer than the power to intercede with the almighty, or to decide a person’s fate after death? The corruption resulting from religious power has of course been clear to see, from the amassing of great wealth by bishops and popes over the centuries, to the sexual abuse of children by clergy of many faiths. And in present-day Iran, the ruling ayatollahs use religion as a pretext for overruling the democratic process and suppressing all political opposition. Religions are not subject to democratic forces, so the only influence that can be brought to bear on them, short of military might, is ridicule and scorn. It’s very hard to maintain your dignity when you are made a laughing stock because of the absurdity and hypocrisy of your teachings. Religious leaders know this, of course, which is why they are so sensitive to criticism — they attempt to characterise attacks on themselves as attacks on the revered figures of the faith, with mixed success. The Catholic church for many years tried to describe the revelations about the abuse of children by priests as a slur on the church itself, but they have now been forced to acknowledge the truth of the accusations. On the other hand, Muslim leaders have so far been much more successful in rallying their faithful to the defence of the religion when it is in fact the inhuman acts committed in the name of Islam that are the reasons for the mockery. All power corrupts, and therefore it is axiomatic that all power structures must be open to criticism. Charlie Hebdo has been performing a vital civic duty in satirising Islam, and it is essential both to society and to Islam itself that it continue to do so. While a small bunch of deluded losers were shocking the world in Paris, a much larger band of murderers has been wreaking havoc across northern Nigeria. The group calls itself Boko Haram, where “Boko” is generally taken to mean western education, and “Haram” means forbidden. This group has been engaged in a long campaign of terror across northern Nigeria and into its neighbouring countries, and the particular preoccupations of the group give a valuable insight into its mindset, and very probably that of the extreme Islamist movement as a whole. In April 2014 Boko Haram kidnapped nearly 300 schoolgirls, saying that the western education of girls was contrary to the teachings of Islam. This, I think, highlights the basic motivation of all fundamentalist muslim extremists (and possibly the extremists of all religions) — they opppose equality for women. Western education is forbidden — so what is it about western education that they find so objectionable? Clearly not technology, because they are happy to use western vehicles, and weapons, and cameras when it suits them. No, what they cannot abide is the fact that in the west, women have equality in law, in society and in politics (well, in theory at least, even if not always in practice). Boko Haram is just a bunch of petty misogynists who have become accustomed to having an unearned position of privilege and power in their society, and who will resort to the most brutal tactics to maintain that position. And with their simplistic brutality, they have shone a light on the motivation of the entire Islamist movement. Many in the west portray the current conflict with Islam as a clash of civilisations, but I’m actually more optimistic on this point. And the answer lies in what the French call laïcité — secularism. The Christian churches have long since learnt to adapt to an environment in which their word is no longer regarded as absolute law, and there is no reason why Islam can not do the same. Secularism is not the enemy of Islam; it is the means to its adaptation and survival. Several centuries ago it was considered normal for those found to have breached certain church laws to be burned at the stake, but nowadays no-one associates Christianity with such practices (except perhaps in some African countries). In a similar manner, muslims are quite capable of relegating some aspects of their faith — like the death penalty for adulterers and apostates — to the dustbin of history. “That was then, this is now”. In fact, I’m confident that the overwhelming majority of muslims in the west already think this way. For those who choose it, religion can continue to be an important part of people’s lives. Just so long as they accept that their religion can not make demands that contravene secular law, and that their rules can not apply to those who choose a different faith, or no faith at all. The buttons in this column all link to other sites, and they all open a new window or tab, depending on your browser settings. On the rest of the page, this symbol denotes a link that goes to another site. Don’t hold me responsible for anything you might find on these other sites; the links are neither recommendations nor guarantees.